On February 19th, the American Museum of Natural History opened the doors of its stunning new Frederick Phineas and Sandra Priest Rose Center for Earth and Space. 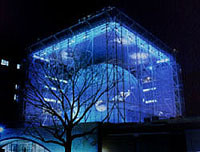 The $210 million project, which has been in the works for six years, includes not only the redesign and reconstruction of the Hayden Planetarium, but also the long awaited repair and revitalization of the museum's entire north side. The completed renovation of the surrounding park this spring will make the Rose Center one of the most glorious public spaces in the city. Effortlessly floating inside a beautifully constructed glass cube, the new Hayden sphere welcomes scientific pilgrims of all ages with a futuristic silver sheen during the day and soft blue glow in the evening. The perfectly constant museum that JD Salinger describes in Catcher in the Rye, which is only as different as you are from one visit to the next, is being brought into the 21st Century with extremely sophisticated technology and the most up-to-date scientific information available. Over the past 130 years, the museum has taught visitors about the rich history and diversity of life on Earth; now, the Rose Center will explore how the earth and its history fit into a much greater time frame, the history of the universe. When you visit, you'll learn that if the time line of the universe is as long as a football field, our entire existence is equivalent to the thickness of a human hair. The Rose Center's main goal is to make science, specifically astronomy and astrophysics, more accessible to the public at every level of understanding, to bring the universe down to Earth. Ellen Fudder, the museum's president, understands that the museum has an opportunity and responsibility "to enable the public to keep pace with the golden age of discovery we are now enjoying in these fields ". All of the exhibits have been designed to allow for frequent updating as new information pours in from NASA and other sources daily.